I haven’t used my Caran d’Ache Museum Aquarelle pencils in a while…they’re pricey, but they’re yummy! They “feel” different when they color – softer, I guess you might say? For most papercrafters they’re probably more than you need; I generally recommend Inktense pencils for crafters. But if you have a few favorite colors from the Museum Aquarelles on your Christmas wishlist, they’d be great stocking stuffers to put on Santa’s list! Watch the video below or click HERE to see it in HD on YouTube. To finish off the card, I diecut the colored image with the Double Pierced Dies from Avery Elle – then diecut another piece, and nested the colored one inside. That left me with 1) a finished clean frame around the card and 2) a nicely pierced rectangle leftover from the second diecutting, for another card! Wow, I just love watching you bring these images to life. Your talent is so great–we just know it is a gift from God. I have not been able to find your email address again. I ordered the mermaid stamps you recommended, but missed your videos. I was in rehab 2 months after knee surgery. Could you please give me directions how to access this series. Kathie. This is my 2nd time dropping by. This video just made my jaw hit the floor! The stamp set is just precious! I have what is a very basic question. When you are using the colored pencils, are you making little dots/dabs? It looks like you are actually lifting your pencil between every little mark! That must be exhausting on your hand! If this is what you are indeed doing, do you have a video explains how you grip the pencil and such? I don’t believe I have ever seen someone use such a technique before! The result is beautiful! I can’t even comment on how you just penciled in the woods! What talent! Thank you for sharing! I’m not familiar with Purple Onion, but now that I’ve seen your video, I must find out more about them. Thanks for introducing me to them. Also I enjoyed your choice of background music. Just a wonderfully artistic video from every possible angle. I’m back from Purple Onion’s website. Just purchased a TON of stamps, but I got a 25% discount (Cyber Monday, I think? ), so my total bill was soooo much better than you might think. 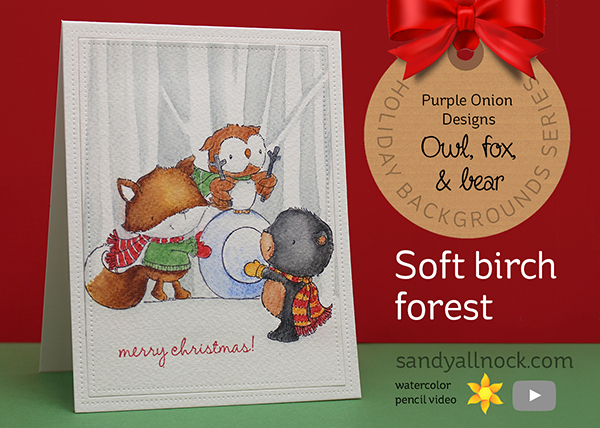 Thanks for featuring the Purple Onion stamps. They are so special and from such a great company. Your watercoloring was wonderful and the background a fun lesson in negative space. So inspiring! Oh what a lovely card Sandy,the birch tree technique you’ve shown us is awesome,many thanks! What sweet images! I just saw Kathy Racoosin using the same images to watercolour and had to dash over to Purple Onion to place an order! Such sweet characters! Your talent is beyond words. Love the card and the coloring! I agree that the ease with which you came up with the trees background was really great. I enjoy watching your videos with and without voice. Just that you consistently share is fab. THAT, my dear Sandy, was AMAZING to watch! TFS! what an adorable card. Wish I was as artistic as you!. Beautiful and love how easily you made birch trees. 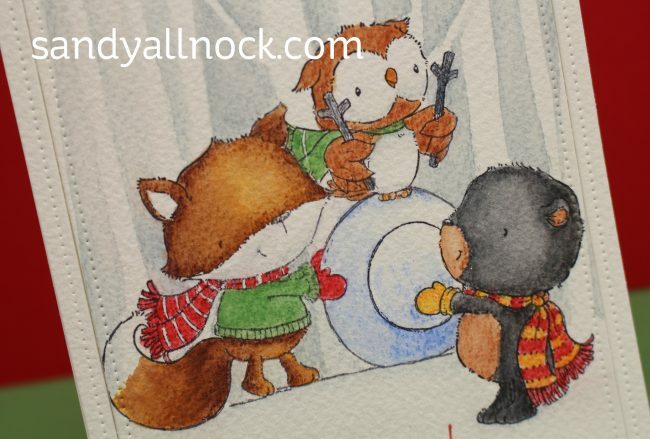 Good morning Sandy, This is one of the cutest cards yet. I wish I could watercolor as perfectly as you. You made those birch trees appear like magic. This was simply amazing. Love all your videos. Thank you. Well, it goes without saying that the card is cuter than anything else I’ll see all day – but what really grabbed my attention was how easily you were able to make a birch forest background! I’m off to see if I can do one – thanks so much for your continued stream of great ideas!! !